The Neduntheevu, sometimes known as Neduntivu is the largest island falling in the Palk Strait in the northern parts of Sri Lanka. 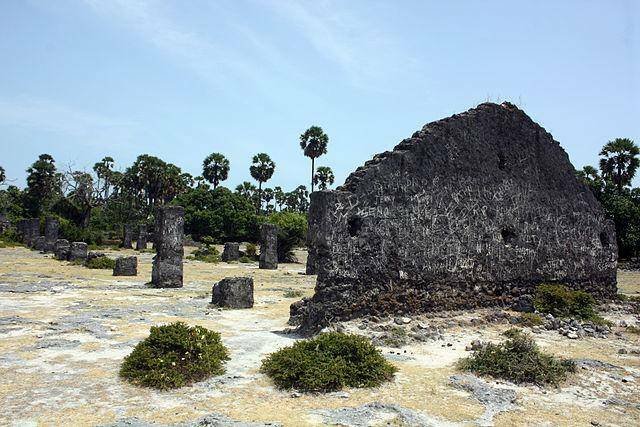 This is known as Delft Island also as it was so called by the Dutch colonials. It happens to be the biggest of the seven inhabitable islands in the region. A unique feature of this island is it is flat and oval shaped which is wind-swept at almost all times, which makes the place very soothing. The surrounding of this island is very mesmerizing. It has shallow waters which houses some of the unique aquatic life. On the island there are varied kinds of dry shrubs and semi-arid tropical plants. As found on many islands, this island also has tall palm trees which add to the overall beachy feel of the island. If you happen to wander far you can spot some ruins of the South Indian Chola architecture to the west of this island. A Giant Baobab tree is planted in this island which, interestingly, can hide up to 15 people under its trunk at a time. The Baobab trees are originally found in South Africa but the Portuguese brought some saplings to Sri Lanka, and this happens to be grown out of one such sapling. A Dutch fort made of dead coral chunks is also located in this island. A very unique experience which is interesting and totally worth the effort! Visit this island for the famous pony rides.